Crimson-crested Woodpecker is a large woodpecker living in very wide ranges of habitats. Adult male has black upperparts with conspicuous white stripes on each neck side, descending on the sides of mantle, and joining in centre of the back, forming a white V. We can see some small black spots on the white stripe on the back. Upper wing and upper tail feathers are black. Female Crimson-crested Woodpecker resembles male, but she has black forehead and slightly larger crest than male. Centre of the red crest is black. She has a broad whitish malar stripe, extending downwards to the neck sides. Juvenile has browner plumage on upperparts, and darker on underparts, with heavier barring. It has mostly pinkish-red head with the same pattern as adult female and whitish supercilium. Young male acquires much red very soon. It reaches its sexual maturity at one year. Crimson-crested Woodpecker utters two typical nasal calls: a vibrating, loud “chis-sic”, and a longer “tttt-he-he-he”. Both sexes drum, male more than female during breeding season. 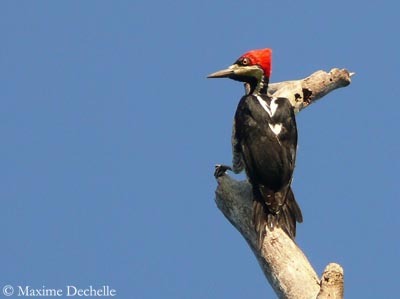 Crimson-crested Woodpecker lives in varied types of habitats, but it needs trees. It is found in cloud forest, rainforest, gallery forest, open woodlands and savannah. It also frequents clearings and forest edges, plantations, pastures and wetlands. According to the country, this species can be found from lowlands to 2500 metres of elevation, locally up to 3000 metres in the Andes. Crimson-crested Woodpecker can be seen sometimes perched in isolated tree away from the forest. RANGE: Crimson-crested Woodpecker is resident from Panama to northern Argentina and south-eastern Brazil, and in Trinidad. Crimson-crested Woodpecker feeds mainly on wood-boring insects and larvae, ants, termites, small invertebrates and caterpillars. It also consumes berries. It gets its prey by giving strong blows against the bark with its bill, in order to remove chips of wood and bark to extract the invertebrates which are into the trunk. It also probes in natural cavities. 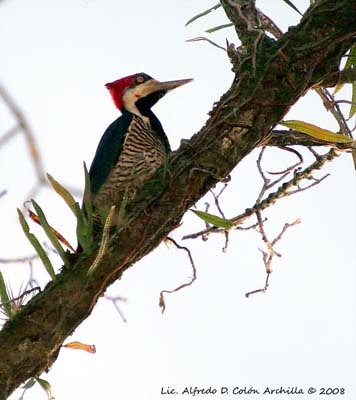 Crimson-crested Woodpecker populations are not globally threatened. It is relatively common in most parts of its range. On the underparts, throat is black. From the breast to the undertail coverts, plumage is buffy-white, sometimes washed green, regularly barred with blackish-brown. Under wing is white, with black tip and trailing edge. On the red head, we can see a conspicuous bright red crest. A buffy-white area surrounds the base of the bill, and lower ear-coverts show small oval black and white area. Strong, chisel-shaped bill is dusky whitish. Eyes are pale yellowish, with greyish eye-ring. Legs and feet are greenish-grey. Crimson-crested Woodpecker is often seen in pairs or in small groups of 4 or 5 birds in the same large dead tree. It feeds mainly on large larvae and insects, ants, termites and caterpillars. Most of larvae and insects are taken from the wood of dead trees. It forages from 6 to 25 metres high in trees, but usually at mid level. 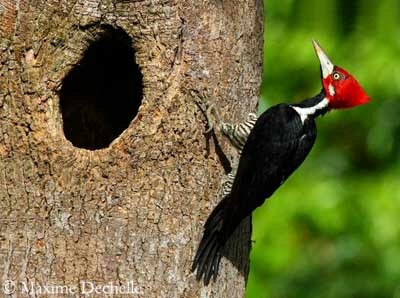 This woodpecker performs long flights from tree to tree, in order to explore the trunks, branches and bark for food. Crimson-crested Woodpecker moves on the underside of limbs, or hangs upside-down on branches. During breeding season, Crimson-crested Woodpecker performs some displays with erect crest, while it swings the head. These displays are accompanied by calls. These calls are low and uttered just before copulation, and when the birds take turns during incubation at nest. These calls strengthen the pair bonds. However, between two rivals, the calls are louder, even if this species is rather silent. 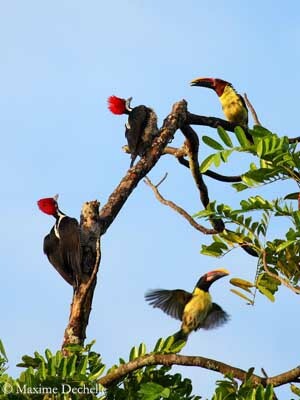 During these disputes, males give shrill piping lacking several minutes. Then, the intruder is chased away from the territory, or both males fight in flight. Crimson-crested Woodpecker performs strong undulating flight. Breeding season depends on the locality. 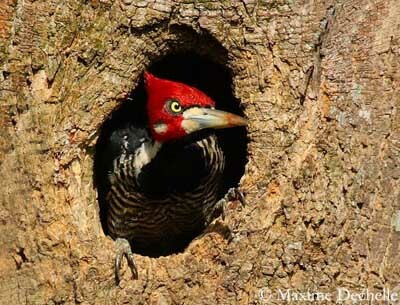 Crimson-crested Woodpecker nests in holes excavated by both adults, relatively high in trees or stubs. The entrance is fairly large, about 45 to 50 cm in diameter, and oval-shaped. Female lays 2 to 3 white eggs, sometimes four. Incubation lasts about 9 to 14 days, by both sexes. Woodpeckers have short incubation period, but at contrary, nesting period is longer than in other birds’ species. Chicks are brooded and fed by both parents, and remain at nest for 3 to 4 weeks after hatching. Young remain within the family group until next breeding season.